UPDATE: January 20, 2015. Target announced this week that it will be closing all 133 stores in Canada, including the Vernon and Kelowna stores. eliminating at least a couple of hundred local $10/hr jobs and a handful of slightly better paid management jobs. The Wall Street Journal is reporting that Target’s 17,000 + Canadian layoffs of low income workers will be the largest in Canadian history. The growing downturn in the fossil fuels industry has extraordinary implications globally. While some are proposing theories that this downturn will be short-lived, there simply isn’t much evidence to support an optimistic forecast. Saudi Arabia is openly executing a long term strategy to squeeze “high cost oil producers,” using its unquestioned leverage and the lowest production costs in the World. Europe is facing potential deflation, and the current European recession is forcing the European Central Bank to begin “quantitative easing,” beginning this week, essentially printing money. The Russian economy is in shambles as the ruble weakens, something Putin did not plan on occurring. The Chinese economy has weakened sharply and will likely remain weak into the near foreseeable future. Meanwhile Canada is at the mercy of these global forces, with little in the way of economic reserves to defend its economy, having bet the entire Canadian economy on oil. Somehow Joe Oliver promised he would balance the Canadian budget in 2015, and then the next day, Oliver ate crow, and walked back his promise. In a surprise move, The Bank of Canada then reduced the lending rate to 0.75%, causing the loonie to plummet below 81 cents. Things are not what the government wants us to believe. There are significant hedge bets in the market that oil will soon return to $100 per barrel. A prominent optimistic theory suggests that Saudi Arabia and the United States are collaborating to squeeze Putin and the Russian oil economy, and oil will bounce back within 90 days. However, most economists and oil industry analysts are projecting a much longer and deeper petroleum industry recession than in the 1980’s, for example. The predominant view is that it will persist for at least five years or longer. MIDLAND, Tex. — With oil prices plummetingby more than 50 percent since June, the gleeful mood of recent years has turned glum here in West Texas as the frenzy of shale oil drilling has come to a screeching halt. Every day, oil companies are decommissioning rigs and announcing layoffs. Small firms that lease equipment have fallen behind in their payments. In response, businesses and workers are getting ready for the worst. A Mexican restaurant has started a Sunday brunch to expand its revenues beyond dinner. A Mercedes dealer, anticipating reduced demand, is prepared to emphasize repairs and sales of used cars. And people are cutting back at home, rethinking their vacation plans and cutting the hours of their housemaids and gardeners. Dexter Allred, the general manager of a local oil field service company, began farming alfalfa hay on the side some years ago in the event that oil prices declined and work dried up. He was taking a cue from his grandfather, Homer Alf Swinson, an oil field mechanic, who opened a coin-operated carwash in 1968 — just in case. Indeed, to residents here in the heart of the oil patch, booms and busts go with the territory. It’s at times like these that Midland residents recall the wild swings of the 1980s, a decade that began with parties where people drank Dom Pérignon out of their cowboy boots. Rolls-Royce opened a dealership, and the local airport had trouble finding space to park all the private jets. By the end of the decade, the Rolls-Royce dealership was shut and replaced by a tortilla factory, and three banks had failed. There has been nothing like that kind of excess over the past five years, despite the frenzy of drilling across the Permian Basin, the granddaddy of American oil fields. Set in a forsaken desert where tumbleweed drifts through long-forgotten towns, the region has undergone a renaissance in the last four years, with horizontal drilling and fracking reaching through multiple layers of shales stacked one over the other like a birthday cake. But since the Permian Basin rig count peaked at around 570 last September, it has fallen to below 490 and local oil executives say the count will probably go down to as low as 300 by April unless prices rebound. The last time the rig count declined as rapidly was in late 2008 and early 2009, when the price of oil fell from over $140 to under $40 a barrel because of the financial crisis. Unlike traditional oil wells, which cannot be turned on and off so easily, shale production can be cut back quickly, and so the field’s output should slow considerably by the end of the year. The Dallas Federal Reserve recently estimated that the falling oil prices and other factors will reduce job growth in Texas overall from 3.6 percent in 2014 to as low as 2 percent this year, or a reduction of about 149,000 in jobs created. Midland’s recent good fortune is plain to see. The city has grown in population from 108,000 in 2010 to 140,000 today, and there has been an explosion of hotel and apartment construction. Companies like Chevron and Occidental are building new local headquarters. Real estate values have roughly doubled over the past five years, according to Mayor Jerry Morales. The city has built a new fire station and recruited new police officers with the infusion of new tax receipts, which increased by 19 percent from 2013 to 2014 alone. A new $14 million court building is scheduled to break ground next month. But the city has also put away $39 million in a rainy-day fund for the inevitable oil bust. Expensive restaurants are still full and traffic around the city can be brutal. Still, everyone seems to sense that the pain is coming, and they are preparing for it. Randy Perry, who makes $115,000 a year, plus bonuses, managing the rig crews at Elevation Resources, said he always has a backup plan. 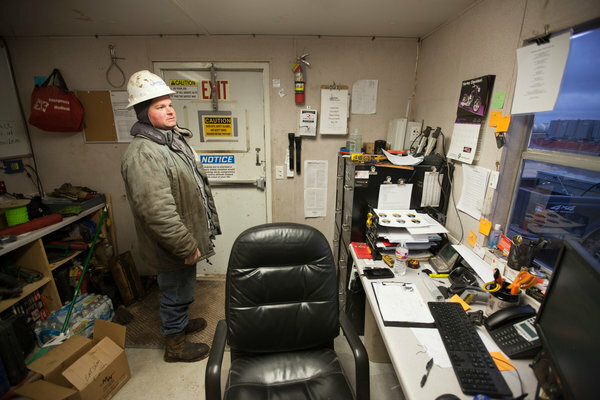 Mr. Pruett’s company had six rigs running in early December but now has only three. It will go down to one by the end of the month, even though he must continue to pay a service company for two of the rigs because of a long-term contract. 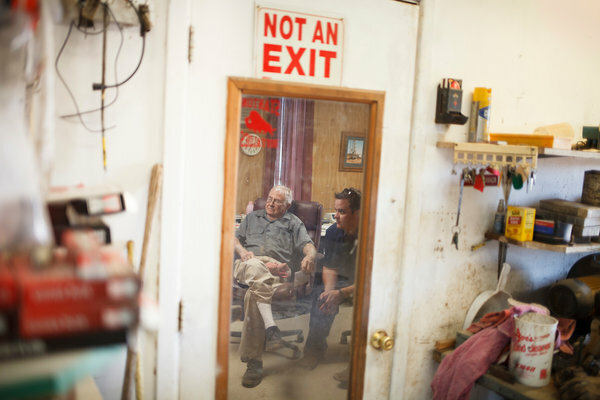 The other day Mr. Pruett drove to a rig outside of Odessa he feels compelled to park to save cash, and he expressed concern that as many as 50 service workers could eventually lose their jobs. But the workers themselves seemed stoic about their fortunes, if not upbeat. 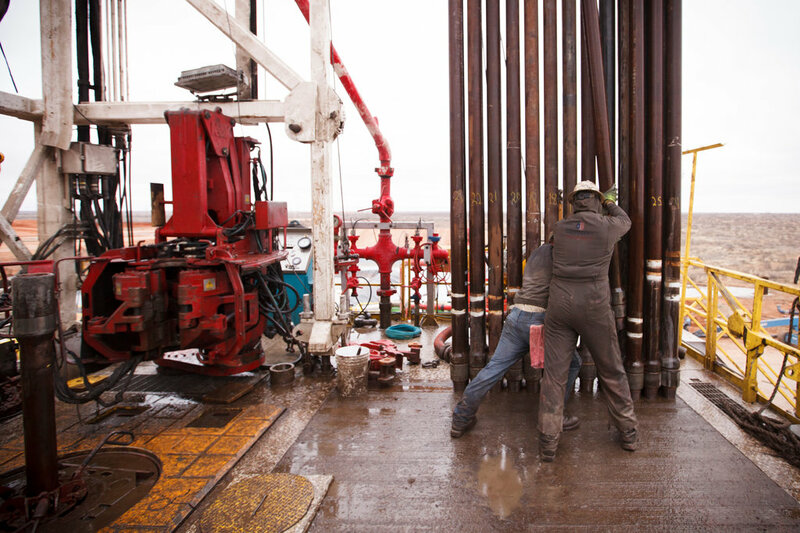 “It’s always in the back of your mind — being laid off and not having the security of a regular job,” said Randy Perry, a tool-pusher who makes $115,000 a year, plus bonuses, managing the rig crews. But Mr. Perry said he always has a backup plan because layoffs are so common; even inevitable. Since graduating from high school a decade ago, he has bought several houses in East Texas and fixed them up, doing the plumbing and electrical work himself. At age 29 with a wife and three children, he currently has three houses, and if he is let go, he says he could sell one for a profit he estimates at $50,000 to $100,000. Just a few weeks ago, he and other employees received a note from Trent Latshaw, the head of his company, Latshaw Drilling, saying that layoffs may be necessary this year. The most nervous people in Midland seem to be the oil executives who say busts may be inevitable, but how long they last is anybody’s guess. Over a lavish buffet lunch recently at the Petroleum Club of Midland, the talk was woeful and full of conspiracy theories about how the Saudis were refusing to cut supplies to vanquish the surging American oil industry. ← Can Accelerate Okanagan’s Report On Local Tech Industry Economic Impact Be Believed?